As well as keeping you fit treadmills are great for green screen. 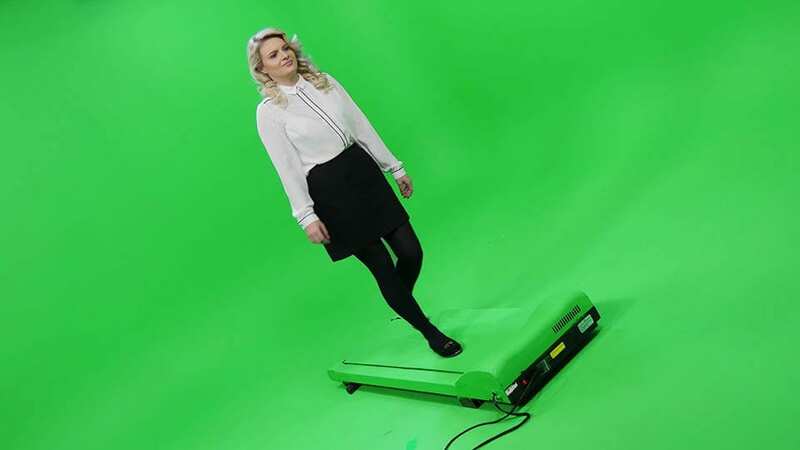 Our Manchester studio specialises in green screen and an essential tool of this type of video production is a treadmill. The green screen treadmill allows you to superimpose your actor on any scene and have them move within that scene. It’s fantastic if you can’t afford or source the appropriate location. One of the keys to making the movement of the treadmill tie into your footage is lighting. In real life as you move around your daily business the lighting around you changes. Moment by moment, second by second, movement by movement. Not only does the environment change around you as you move but, think about it, so does the light around you alter. Maybe it reflects off an object your passing, maybe it becomes dappled as you walk through trees, perhaps you walk from natural into artificial light. In your green screen environment it’s not just enough that you change the background as your actor walks through your chromakey background. You need to change the lighting on him or her too. Moreover doing this truly makes the green screen treadmill, your actor and your background work in tandem together. Galleon Studios has been expertly equipped with a myriad of lighting options to match the mood and environment you are aiming to create in your final production. What is more we have a wide variety of green screen tools within our amazing Manchester studios to enable you to achieve fantastic results. Coupled with this we have a talented crew to hand who are experienced, ready, willing and able to bring your green screen production to life. The treadmill really is a great way of fully embracing the world of green screen. Furthermore you can use it with our other specialty green screen kit. This includes our live keyer. Our live chromakey keyer kit allows you to see your final key as you shoot. So if you have your final backgrounds you can blend your actor, chromakey treadmill and the world you’ve created for them all together as you shoot. The treadmill can not only be used in our infinity cove studio and our soundproof studio but also on location. Many productions have taken advantage of the running machine for films, commercials, training videos and especially music videos. If you’ve opted to shoot a chromakey production you’ve already chosen to make your production stand out from the herd. Why not add real production values, real technical skills and real inventiveness and use our green screen treadmill? The treadmill we have to hire at our studios is robust, simple to operate and practical. What’s more we’ll happily demo the kit for you, and like our other specially purchased green screen filming kit, we always add it a quick lick of paint to before hire so you’ll always be able to key it as quickly and efficiently as possible.